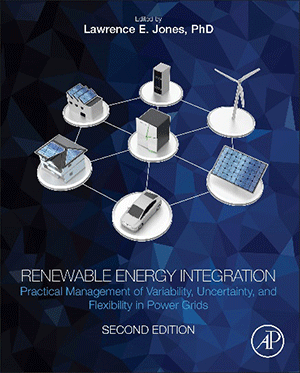 PNNL research is featured in a new book about integrating renewable energy into the power grid. "Incorporating Forecast Uncertainty in Utility Control Centers" is Chapter 11 of the 2017 book, Renewable Energy Integration: Practical Management of Variability, Uncertainty, and Flexibility in Power Grids. The PNNL book chapter describes the state of the art in dealing with the uncertainties inherent in renewable energy sources for the grid. Planners and operators must keep the power grid stable so that energy is delivered reliably and consistently to customers. One of the challenges of integrating renewable energy into the grid is the intermittent nature of sources such as solar and wind. Because these kinds of energy supplies are not “always on,” they create more variability when operators add them to the power grid mix. If not managed properly, this variability could cause power spikes or deficits. Operators must understand and accurately predict these variabilities to keep the grid stable and operating within levels required by regulatory standards. This is a constant balancing act over days, hours, and even minutes. Operators must continually predict the amount of solar and wind power and maintain system balance by adjusting conventional energy sources like coal, oil, and natural gas. And they must do this while accounting for the time it takes for additional generators to start up and come on line, as well as meeting fluctuating energy demands by consumers. The challenge is that traditional software tools don’t adequately predict and account for the variabilities in renewable energy sources. This is where PNNL expertise comes in. PNNL power system experts Yuri Makarov and Pavel Etingov, with former PNNL researcher Jian Ma, contributed to the new book about best practices worldwide in integrating renewable energy into the grid. Drawing from their combined 60+ years of experience in energy research and development, the PNNL engineers demystify the sources of uncertainty and suggest new approaches to account for them. The researchers define and explain the sources of uncertainty, including forecast errors, unexpected generator shutdowns and malfunctions, deviations in conventional generators, and variations in net load. The power systems community needs to shift its approach dramatically for grid operations and planning, according to the PNNL experts. Why? "Current tools for balancing power systems rely established flow patterns, typical stresses, and known congestion paths," Etingov said. "But with the increasing randomness and variability impacts on modern power systems, that approach is falling short." Makarov, Etingov, and Ma present a new approach based on uncertainty models for each contributing factor, combined with performance and reliability criteria. A case study from California, which leads the nation in renewable energy production, demonstrates an early example of this approach. The California Independent System Operator, which manages the state’s power grids, is using a PNNL-developed uncertainty prediction tool that visualizes the impact of wind and solar generation. Using the tool, operators can see potential shortfalls in the coming hours and take corrective actions to prevent them. How does this tool work? The tool forecasts and shows how the system conditions are expected to change, so that operators can better adjust balancing needs. An important and novel part of this approach is including multiple sources of uncertainty, both continuous and intermittent. The tool predicts the required generation in worst-case scenarios, with a user-specified confidence level. Operators can use the results to understand and adjust generation capacity availability. The tool also predicts the energy reserve requirements for the next operating day, leading to cost reduction without compromising grid reliability. “The better you can predict how the renewable resources will behave in the overall system, the more efficiently you can balance it, thereby improving reliability and minimizing cost,” explained Etingov. The book is already garnering praise. A reviewer called it a “sweeping, essential reference work by a highly distinguished group of experts.” The PNNL researchers also contributed a chapter on the same topic to the first edition of the book in 2014. The second edition reflects the rapid advancements since then, as utilities worldwide ramp up their renewable energy use. Readers include power system professionals, planners, managers, engineers, and researchers who want to understand the impact of renewable energy. This research is based on work funded by the California Energy Commission under the Public Interest Energy Research Program and the U.S. Department of Energy’s Office of Energy Efficiency and Renewable Energy and the Office of Electricity Delivery and Energy Reliability. The book is available for purchase from the Elsevier website.